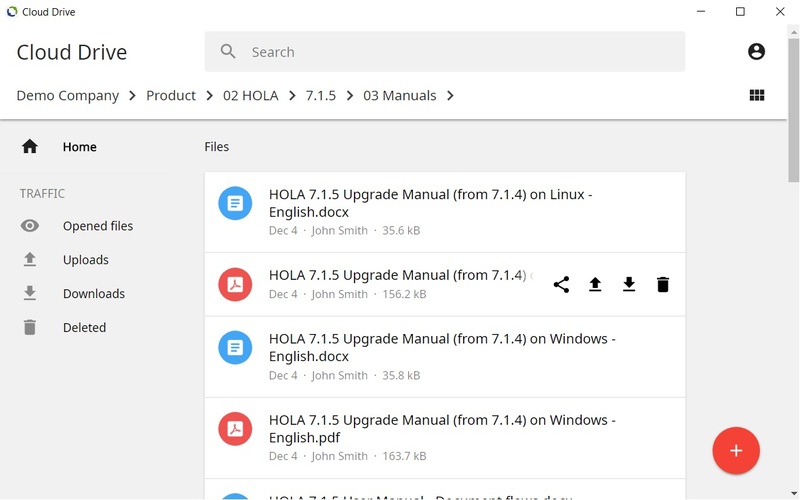 HOLA is a collaborative, enterprise level document management system. We help organizations and their teams to make sure that documents that are important to them are centrally stored and securely accessible to all users and outsiders who should have access to them. Our goal is to ensure that HOLA contains features & tools wich are simple, easy to use, but powerful and flexible enough to cover document management needs of our customers. We understand that our customers & users are busy with meeting their business objectives. That's why we are offering solution that gets the job done and moves out of the way. HOLA is a business tool for effective & efficient management of documents. We strongly believe in "no fuss" practical approach, with strong focus on making core features simple, fast, easy to use, clear to understand and pleasure to use. HOLA is here for you to automate and minimize your time with document handling, so you can focus on what really matters! We all know that security matters. You care about your own privacy. Organizations care about secure and authorized access to their assets. HOLA takes security very seriously and provides security features & tools that span across the application and its features. 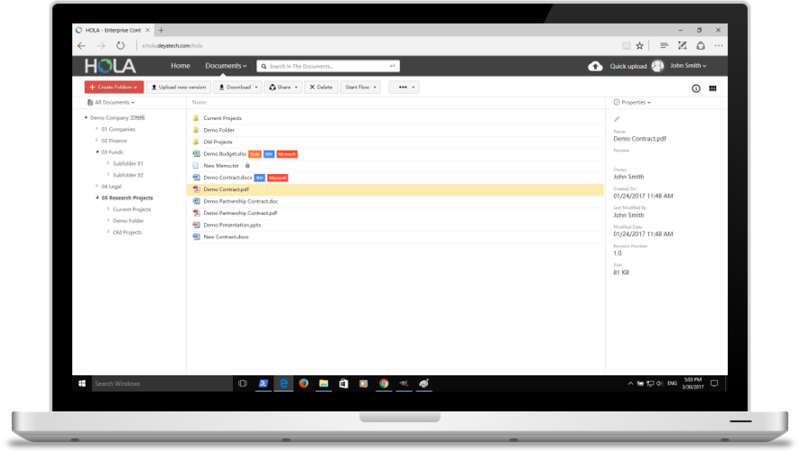 From granular user, group or role based document level security, to secure sharing with users or outsiders, to temporary access, to audit trail, to secure logging-in & logging-out, to encrypted browser/server communication, to backups and much more. Speed is essential in current competitive business environment. Achieving speed requires people to work together & collaborate. 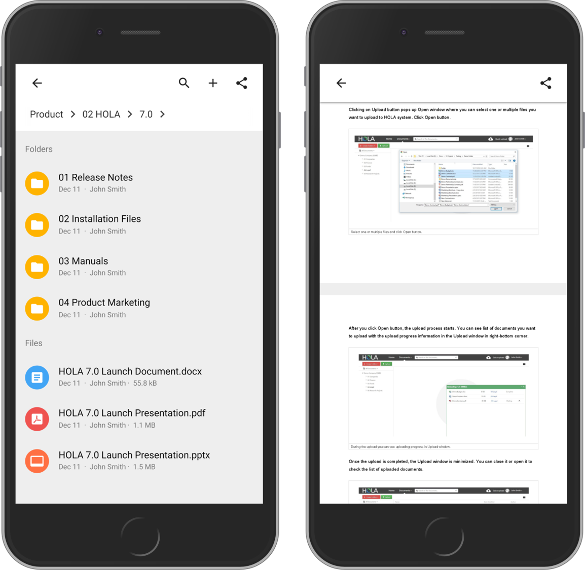 HOLA provides tools for easy and fast collaboration among team members, while protecting their work from accidental modification or deletion. We also make sharing accessible, very easy and very secure - regardless if you share with your team members or outside contractors. The amount of documents and data that organizations generate grows on a daily basis. There is a strong need and business case to store, keep & manage these documents. However, once the data gets large, the location and retrieval of proper document becomes time-consuming and problematic. HOLA provides powerful search engine with search results rendered in sub-seconds. Searches can be executed based on textual content of the documents, document meta-data or custom-defined index card meta-data. HOLA automatically handles content indexing during upload process. Search results can be easily filtered based on automatically generated filters. Ability to access your documents anytime, anywhere and from any device is paramount. Mobile access to your information provides you with the ability to make business decisions without any unnecessary delays. HOLA Lite is a mobile web app that enables you to connect to your HOLA system regardless of the screen size of your mobile phone or tablet, or the type of mobile operating system you run on the device. HOLA Lite runs inside any modern web browser (including built-in WeChat webview). With HOLA Lite you can access and perform necessary actions on all your cabinets, folders and documents. There are times when you need quick and easy access to your documents from your desktop or laptop. HOLA Cloud Drive is a desktop application that can be installed on Windows, MacOS and Linux operating system, and can connect to your HOLA server. This desktop application provides you with simple, fast and responsive user experience that focuses on core document management features. Cloud Drive also enables you to upload entire folders into HOLA as well as edit your documents with native applications. If your upload or download gets interrupted (poor network connection, application or computer shutdown), Cloud Drive will automatically resume your upload or download. Get in touch to learn how to run HOLA in your organization.